When an animal shelter in western Moscow burned down earlier this month in a possible arson attack, it was just the latest setback for the city's dog shelters and stray dogs. The shelter's director blamed the Nov. 5 blaze, which killed seven dogs, on vigilante dog hunters, an emerging wave of whom has taken credit for hundreds of killings around the capital. On Nov. 10, a criminal case was opened in connection with the incident. Experts continue to examine the area surrounding the Alma shelter, but they are now treating the case as arson, Federal Fire Service head Sergei Chervyakov told RIA-Novosti on Tuesday. According to some estimates, tens of thousands of dogs roam Moscow's streets, with at least another 17,000 housed in private and state-owned shelters. In recent years, the state-owned shelters have been hit with corruption scandals, and they are criticized for what animal rights activists describe as dismal conditions and a poor record of finding owners for strays. Activists also blame a lack of federal legislation regulating pet ownership and animal treatment for contributing to the dog problem. Some 16,600 attacks on people by stray animals were reported in Moscow in 2008, the latest year for which those records are available, RIA-Novosti reported in August. Thousands of dogs are taken off the streets and put into shelters, but dogs in state facilities rarely survive two years, said Natalya Yunitsyna, local director of Giving Hope, an international animal-focused charity. "You can come to a state shelter, and a large part of the dogs you cared for the previous week are missing, and no one can tell you where they've disappeared," she said, adding that poor nutrition and cramped living quarters were largely to blame. Ksenia, a volunteer at Moscow's largest state-owned shelter who declined to provide her last name in order to speak freely, agreed with Yunitsyna's assessment. "Conditions at shelters definitely decrease life span," she said, speaking from her experience volunteering. "Workers at shelters are paid low wages, and many have little personal interest in the dogs' welfare." Other volunteers at the Kozhukhovo neighborhood shelter, a 2,500-dog facility, said standards of nutrition were appalling. One quoted a price of 300 rubles (less than $10) per 30 kilograms of dog food and said the vitamin deficiency causes many dogs to lose their teeth. Maxim Grishkov, the shelter director, dismissed the allegations of poor nutrition. "The food is perfectly decent," he said by phone. "We buy two tons of dog food daily and pay for the quality we're able to afford. Most of the dogs taken in by us are ill at the time of arrival. The issue is not the food." It's unhealthy to change a dog's diet once it becomes accustomed to it, Grishkov added, noting that some workers had been fired after trying to supplement the approved food with products of "unknown origin." According to government figures, $24.5 million was allocated to animal shelters in Russia last year, with at least hundreds of thousands of dollars spent in Moscow. Dogs in private shelters are subsidized for the first six months of their care, after which their upkeep is funded through donations and sponsorship. Yunitsyna said embezzlement of these funds occurs to varying degrees at all of Moscow's shelters. "Government shelters must legally change administration each year, and annual tenders are held to facilitate the process," she said. "Into the winning company's hands is transferred a facility that is already overcrowded, yet the newly appointed administration is required to take in a certain quota of dogs to fulfill the terms of the tender agreement." "Submitting counterfeit documents declaring new arrivals to the shelter can therefore be a method by which a company fulfills its contractual obligations, at least on paper, and makes a profit in the process," she said. Grishkov played a role in a sting operation as part of one bribery scandal. Oleg Sotov, deputy chairman of a commission that deals with state contracts in Moscow's Eastern Administrative District, solicited a bribe of 700,000 rubles ($22,000) from the Kozhukhovo shelter's administration in exchange for "access to the state budget," state-run Rossia television reported in November 2011. Grishkov said he had worked with police to catch Sotov. "All my activity was under police control," he said, adding that the case against Sotov is pending. A July investigation by Moscow police uncovered a scheme involving large-scale embezzlement of state funds allocated for the sterilization, inoculation and electronic tagging of dogs. According to a ministry statement, losses resulting from more than a thousand detected forgeries exceeded 9 million rubles ($290,000). There are 12 state-run shelters in the city and as many as 20 private facilities, according to various estimates. Yunitsyna estimated that about 17,000 dogs are housed in state and private shelters in the city, while RIA-Novosti reported in August that there are 27,000 dogs in state care alone. In 2007, the government announced plans to construct shelters in each Moscow administrative district, with 24 set to open by early 2009. By mid-2010, however, only 11 had opened, a glaring inconsistency that a Moscow Times investigation shed light on at the time. 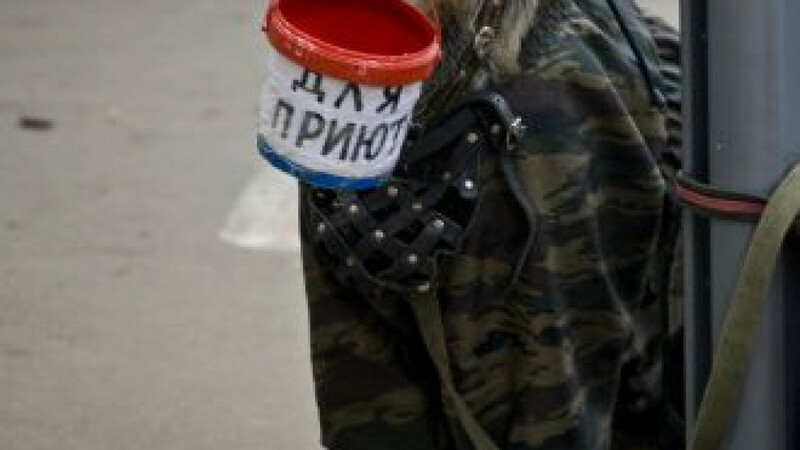 Konstantin Sabinin, an activist for Vita, an animal rights group, said the issue of homeless dogs in Moscow cannot be solved until fundamental laws governing pet ownership, long enforced in the West, are implemented in Russia. "You can build as many shelters as you like and accommodate hundreds of thousands of dogs, but they will simply continue to fill up unless private dog ownership, the root cause of the problem, is brought under control," he said in a telephone interview. Most European countries have strict laws relating to animal welfare. England introduced such laws in 1822, Sabinin said, while in 2002, Germany became the first country to amend its national constitution to acknowledge animal rights. All dogs in Switzerland, whether private or sheltered, are implanted with electronic chips. Laws in the West relating to animal euthanasia vary. In most Western countries, including Britain and the United States, dogs put into shelters are euthanized within a few weeks if a home cannot be found, while in Germany, France and Switzerland, the practice of putting sheltered animals to sleep is forbidden. In Russia, there is no law governing the topic, Yunitsyna said. "We have no law that authorizes euthanasia. That is, euthanasia is not authorized, nor is it prohibited," she said. According to the Civil Code, a stray dog must be kept for six months while the former owner is sought, she said. Despite the introduction of some minor temporary legislation in the 1990s, Russia has no federal law regulating the treatment of animals. There is only an article of the Criminal Code that stipulates punishment of up to two years in prison for abuse of animals. Since the breakup of the Soviet Union, the approach to strays has been different in each region, and laws are determined by local administrations. There are also no laws regulating pedigree-dog breeders, whose activities are neither monitored nor subject to taxation. In 2004, Vita spearheaded a celebrity-backed campaign to get approval of a bill protecting animals from inhumane treatment. The bill had passed the State Duma and the Federation Council but was vetoed by President Vladimir Putin in 2000. In 2008, the Duma finally rejected the bill. A proposal governing pet ownership in Moscow was passed by the Duma in the second of three readings in 2005. That bill included a ban on killing animals for population control and regulations intended to control the breeding market. After a two-year amendment process in preparation for the third and final reading, and several attempts at passage, the bill remains in the pipeline. Adoption numbers for Moscow shelters are a problem as well, activists say, with rates in the city much lower than in some European countries. Yunitsyna said that on average 1,000 dogs are adopted every year from each shelter in France, where an effective system of "social propaganda" is in place, while in Moscow only about 180 find owners, despite teams of volunteers tasked with overseeing the process. Sabinin described the number of adoptions as "microscopic." But Grishkov said his Kozhukhovo facility has done everything possible to get stray dogs into people's homes. "In the four years since I started working at the shelter, we've found homes for more than 1,400 dogs. The 247 dogs adopted in the Eastern Administrative District last year was the absolute maximum number possible because there simply are no more left on the streets," he said. "This is good news, as the city's program is clearly working. Just take the example of the Eastern Administrative District," Grishkov said. Figures from Moscow's administrative districts based on records submitted by shelters show that more than 5,000 dogs find owners each year, a number that activists contest. Today, about 2 million pets are kept in Moscow homes, and thousands continue to be thrown onto the streets each year by residents who can no longer afford to support them, according to Vita. Shelters receive several requests on their websites daily from owners of newborn puppies and people unable to care for their pets anymore. Until laws on dog ownership are implemented and a culture of taking in strays is encouraged, activists say, further efforts will continue to stall at the final hurdle, and the problem is likely to escalate. Moreover, they say, people determined to take advantage of a failing system will persevere in their efforts to expose its flaws for financial gain. "There must be a will at the top to fix this issue, an acknowledgement from the government that the issue exists," Yunitsyna said, echoing Sabinin's suggestion that the only solution to the problem is "a change in government policies toward homeless animals."